I live on the fifth floor of an apartment building that doesn’t have an elevator. This might sound a little lazy, but sometimes I just can’t be bothered to walk down (and then back up again) all those stairs to buy supplies for dinner … even if the closest shop is right across the street. Luckily, figuring out what to do with all the bits and bobs I tend to have leftover is one of my favourite activities. Some of my most memorable meals have been born from simply cleaning out the fridge or rummaging through the semi-abandoned contents of my crisper. Greatest hits in this repertoire include the caramelized onion dip my friend Rebekah came up with, the spicy kimchi fried rice I made for lunch yesterday and the warm lamb salad made from leftovers the day after our wedding. To get started, simply take stock of what you have to work with. Keep in mind that some things might not be at their most glorious (yes, I’m talking about you, wilted parsley), but that doesn’t mean they should be relegated to the garbage. Refresh those herbs in ice water, or peel back the sad outer layers of that cabbage you’ve been meaning to use up, and get ready to make some magic. Having a well-stocked pantry to work with (and at least the basics: a good olive oil, some fleur de sel and a couple of different vinegars), while not mandatory, will certainly make your life a lot easier. It is also worth noting that handfuls of seeds or nuts, a box of dried pasta, a can of tomatoes or even a pack of instant ramen can be game changers when you are trying to bring a bunch of random things together. Finally, although this recipe can most certainly be shopped for and made as written, the ingredients listed don’t need to be seen as a set of rules that can’t be broken. I hope you will feel free to change things up as you see fit, especially if it means helping you use up something that you already have on hand. The world, or the back of your refrigerator, anyway, is your oyster! Using a mortar and pestle, pound the toasted walnuts until they are roughly chopped. Transfer to a medium-sized bowl. Pound the Parmesan cheese petals until they are about the same coarseness as the walnuts. Add the cheese to the bowl with the walnuts along with the olive oil, lemon zest, lemon juice, harissa, chopped shallot and a good dose of freshly cracked black pepper. Stir until combined. Taste and adjust seasoning if necessary. 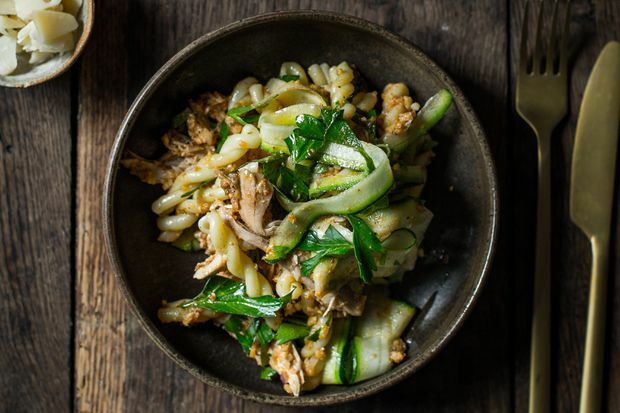 Cut zucchini into thin, noodle-like strips using a peeler. Toss with a good pinch of salt and set aside for 15-20 mins so the zucchini can let off any excess water. Strain liquid before using. Meanwhile, bring a pot of well-salted water to a boil. Cook the dried pasta until it is al dente. Strain and add to the pesto along with the strained zucchini strips, pulled chicken and chopped parsley. Stir to combine. Adjust seasoning if necessary. Serve immediately.